One of the new features that just debuted is a new notification system for Insightly. Users now have the ability to follow items in Insightly like tasks, contacts, organizations, opportunities, projects, emails or notes, and receive email updates when any changes are made to those items. This is useful when you want to be notified when a task you assigned to another user has been completed, or when the details of a contact you are interested in are changed, or when another user adds new files to a project you're following. 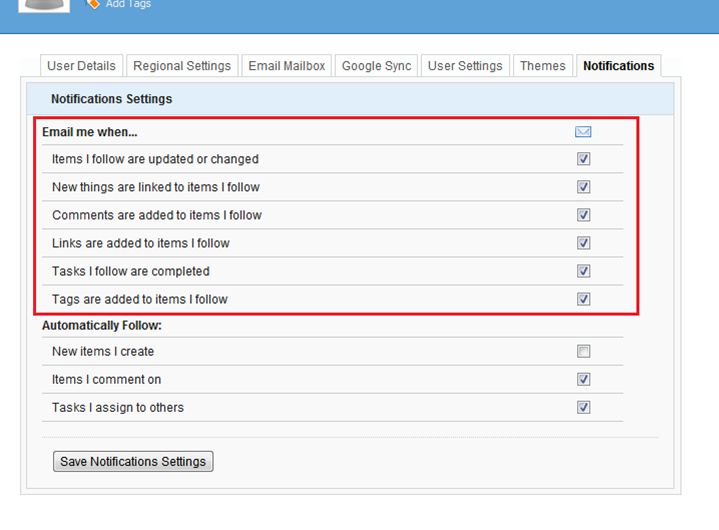 To turn on the email notifications, navigate to the page for the individual item you wish to follow and receive notifications for, and click on the blue “Follow” button on the top right corner of the blue header bar. When you click the button it will turn green to indicate you are following that item. 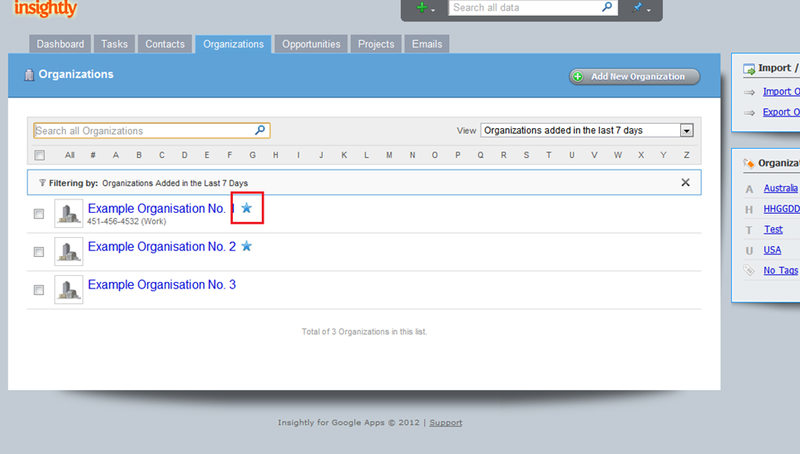 For items that you are following, a blue star will appear next to that item in the list view. 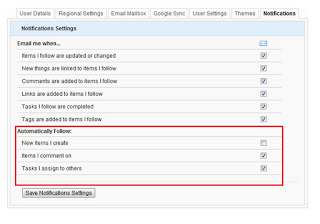 To select what actions you would like to receive email notifications for, go to My Info > Notifications. The 'My Info' page is the small card icon in the top right corner of Insightly. In this screen, click the 'Notifications' tab, and check or uncheck the boxes corresponding to the actions you would like to be notified of. You can also choose to follow some items in Insightly automatically without having to explicitly click the 'Follow' button each time. This is useful for receiving comments on notes you have created, or updates on a task you assigned to another user to complete, or when other users update items you created. 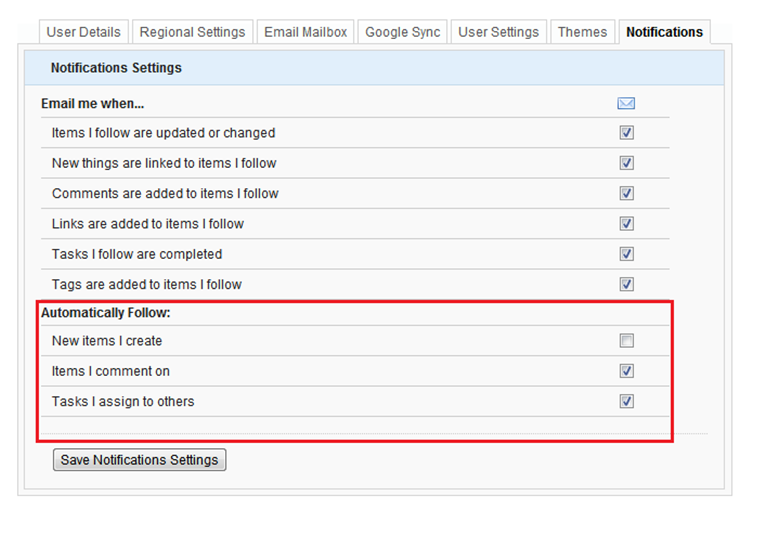 Checkboxes for those are below the email action options. To view a list of your current notifications within Insightly, rest your pointer over the orange speech bubble icon in the top right corner of Insightly, as shown below. To view a list of items that you are following, click on the Notifications icon on the top right hand side of the screen. Then click the link for “Items I’m Following”. A page will appear with the following tabs – Contacts, Organizations, Opportunities, Projects, Tasks, Emails, Notes. You can click on each of these tabs to see the items you are following. 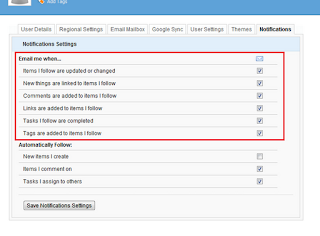 You can also choose to “Unfollow” any item by clicking on the “Following” button next to that item. AWESOME work guys. Love watching you guys ship out updates like this consistently. Question on this feature - will changes to a project's TAG trigger a notification? I'm doing some testing and it doesn't look like it does. We don't trigger a new notification when tags are changed at present, but it is something we will consider for a future version if we get enough requests for it. This is a great feature. Is there a way to follow a group of organisations or contacts (without needing to open each organisation)? It would be good to have more control over notifications - for example if people don't follow something how will they be notified? If I assign a task to someone else I would think that the other person should be able to be notified automatically but this does not seem to be the case? e.g. there should be ability to "Automatically Follow any task that is assigned to me". I would appriciate Jim's idea solution, now person assigned in a task must be noticed somehow to click Follow, and that's not the right way.